The Blind Man No. 2, page 4. Editors: Henri-Pierre Roche, Beatrice Wood, and Marcel Duchamp. 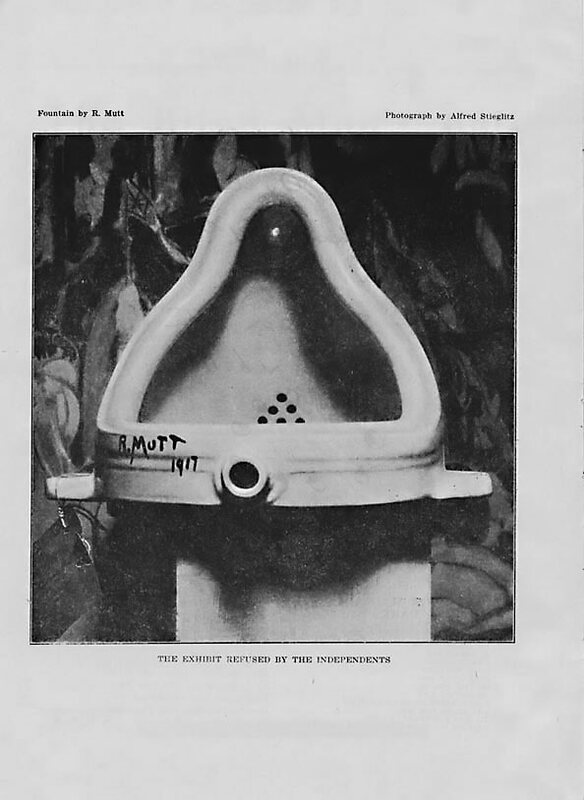 Published in New York, May 1917 Fountain by Marcel Duchamp. 1917. Photograph by Alfred Stieglitz. • His art was said to break away from the false tradition of the masters : to show a vigorous alternative viewpoint on human experience. • Picasso held a “Rousseau banquet” in his studio in November 1908 to celebrate the Douanier. • May 1946 Gallerie Rene Drouin, Paris. • In the wake of the war, the liberation, the gas chambers and the atom bomb the French art public expected an art that was redemptive, sublime, humane. It got Dubuffet’s “informel.” Art critics were quick to condemn the artist and likened his work to bodily excreta. • Dubuffet had already prepared his answers. • No special gifts or skills had gone into the making of the show. • 1948: Compagnie de l’Art Brut. Egs Scottie Wilson 1891-1972; Alfred Wallis 1855-1942. Francis Bacon interviewed by David Sylvester. "Where did you go to school? Or did you not? I went for a short time to a place called Dean Close, in Cheltenham. It was a kind of minor public school and I didn't like it. I was continually running away, so in the end they took me away. I was there only about a year. So I had a very limited education. Then, when I was about 16, my mother made me an allowance of £3 a week, which in those days was enough to exist on. I came to London, and then I went to Berlin. …….And the nightlife of Berlin was very exciting for me, coming straight from Ireland. But I didn't stay in Berlin very long. I went to Paris then for a short time. There I saw at Rosenberg's an exhibition of Picasso, and at that moment I thought, well I will try and paint too. How did your parents react when they heard about that idea? They were horrified at the thought that I might want to be an artist. " The following aspects of modern art reinforce the rejection of the academic and traditional: Avant garde; The Going Away; Manifesto Art; Alternative audiences, the Unconscious. • French term derived from military vocabulary: the vanguard troops who explore the terrain in front of the regular infantry. • Why did it come about? Nineteenth century capitalism reaching such a pitch that the art object became fully implicated in the commodity market. Seen as eroding the special nature of art. • Paris had become a huge cultural centre with art training bottlenecking hundreds who hoped to be artists. Highly trained and motivated individuals seeking alternative outlets for their talents, interests and criticism. Paradox 1: avant garde often acted in the name of everyone, the common person, the excluded. However the nature of the gesture, difficulty of the language or shocking tactics involved often alienated those in whose name the art was supposedly created. Paradox 2: the difficult or unexplained art ideas often suggested that the art was elitist despite intentions to be otherwise. Paradox 3: modern artists presented themselves as heroes fighting for our self-expression and creative freedom. However these male heroes did little to include the female half of the population. Women artists and viewers were often treated poorly in avant garde circles. see Cottington D. (2005) Modern Art, A Very Short Introduction, Oxford, OUP. Paul Gauguin, Breton Shepherdess, 1886. PMB went away to Worspede as a 22 year old in 1898, met her husband Otto Modehrsohn. Visited Paris in 1900 were she saw work by Cezanne, Vollard, Van Gogh. Her work engages directly with the experience of childbirth, motherhood, and fertility. Whereas Gaugin eroticised his naked women, Becker was much more able to identify with the experience and make it complex albeit in very simply painted and realised images. Going Away: Die Brücke, Playing Cowboys and Indians. Artists include Fritz Bleyl (1880-1966), Erich Heckel (1883-1970), Ernst Ludwig Kirchner (1880-1938) and Karl Schmidt-Rottluff (1884-1976). “We want to glorify war - the world’s only hygiene - militarism, patriotism, the destructive act of the anarchists, the beautiful ideas for which one dies, and contempt for women. We want to destroy museums, libraries, and academies of all kinds, and to make war on moralism, feminism and on every opportunistic and utilitarian vileness...."
In 1909, with Futurism only one year old, a Manifesto of Futurist Painters was published, written by Boccioni. Paris, Zurich, Berlin. Dada. 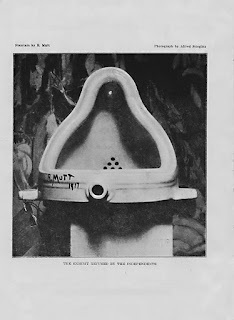 Artists include Duchamp, Ball, Grosz. The unconscious, paint and the world of dream. Artists include Andre Masson, Dali, Bunuel. • Cottington D. (2005) Modern Art, A Very Short Introduction, Oxford, OUP. • Foster and others (2004) Art since 1900,, Thames and Hudson.